Grapefruits are large citrus fruits related to oranges, lemons and pomelos. These delicious fruits can be white, pink or ruby which is indicative of their flesh and not their skin colour. Grapefruits have a yellow or pinkish-yellow skin. 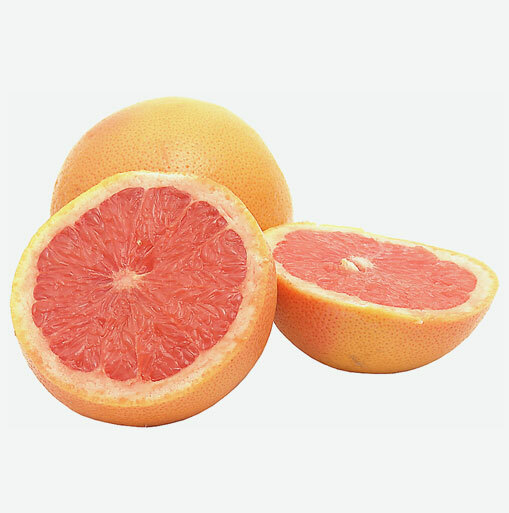 Grapefruits can range from four to 6 inches in and some grapefruit varieties have seeds and some are seedless. The delicious flavour of a grapefruit is juicy, sweet and has an underlying tartness or tanginess. Drinking grapefruit daily reduces the risk of kidney stones. A study published in the British Journal of Nutrition found that when women drank grapefruit juice daily, their urinary pH value and citric acid excretion increased significantly which dropped their risk of forming calcium oxalate stones or what are known as kidney stones. Grapefruit is an excellent source of vitamin C which helps support the immune system. Vitamin C-rich foods like grapefruit may help reduce cold symptoms or severity of cold symptoms; over 20 scientific studies have suggested that vitamin C is a cold-fighter. When selecting grapefruits, remember, the right grapefruits do not have to be perfect in colour. Grapefruits may have some skin discolouration, scratches or scales that may affect their appearance, but they don’t subtract their texture or quality. Grapefruits should be heavy for their size with a tight skin. Avoid thick-skinned grapefruits that have soft spots. Grapefruits should be firm, yet slightly springy when gentle pressure is applied. Did you know that grapefruits are juicier when they’re slightly warm rather than cool? This is one good reason to store them at room temperature if you are planning on consuming them within a week of purchase. If you will not be eating them within a short time, then store them in the crisper of your refrigerator and they will keep for up to two weeks. Rinse grapefruits under cool water before eating them to prevent transferring any dirt or bacteria that may live on the skin’s surface. Grapefruits are usually eaten fresh by slicing the fruit horizontally and scooping out sections of the halves with a spoon. To separate the flesh from the membrane you can either cut it with a sharp knife, a special curved-blade grapefruit knife, or a serrated grapefruit spoon. If there are seeds, you can remove them with your spoon before you eat the fruit. Try adding grapefruit sections to your green salads. To add variety to your day, start with a glass of freshly squeezed grapefruit juice instead of orange juice. Add grapefruit sections or segments to seafood salads, fruit salads or make delicious tangy chutney.